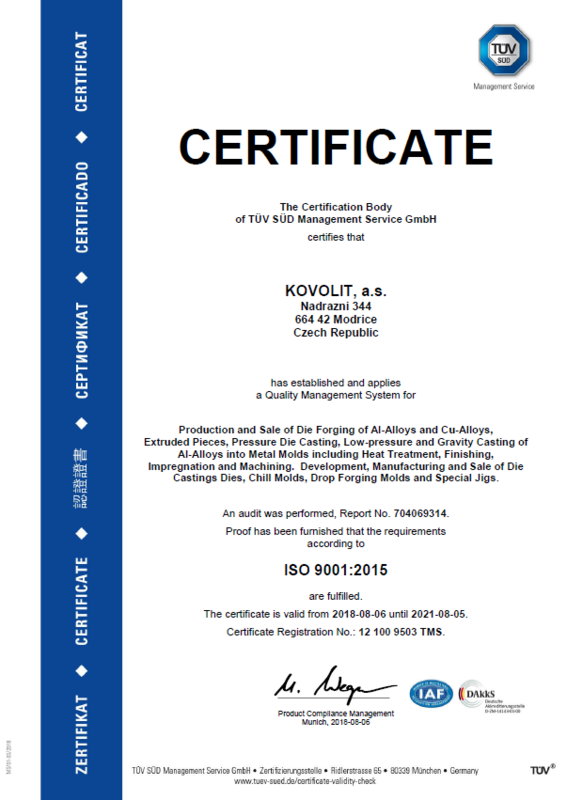 Kovolit, a.s. is one of the leading manufacturers of aluminium die castings and die forgings from non-ferrous metals in the Czech Republic. Joint-stock company Kovolit, a.s. dates its history from 1921, when a machine shop Koloferra was established in Modřice near Brno as a joint stock company of Czech Commercial Bank in Prague. In 1934, a forge was put into production enabling the manufacturing of die forgings from copper, brass, bronze and aluminium. The operation was gradually extended to include a foundry which specialized in casting of aluminium alloys. After 1947 the company was nationalized and transformed into a national company, to which a sand casting foundry in Česká municipality was affiliated in 1954. A forge shop "Moravské kovárny Jihlava" became a part of Kovolit, a.s. in the 80s. The whole group had 2,100 employees at that time. Both affiliated companies became independent after 1990 in the context of privatization, and Kovolit, a.s. transformed into a joint-stock company in 1990. The Remet, spol. s r. o. company from Brno entered into Kovolit, a.s. joint stock company in 1995. 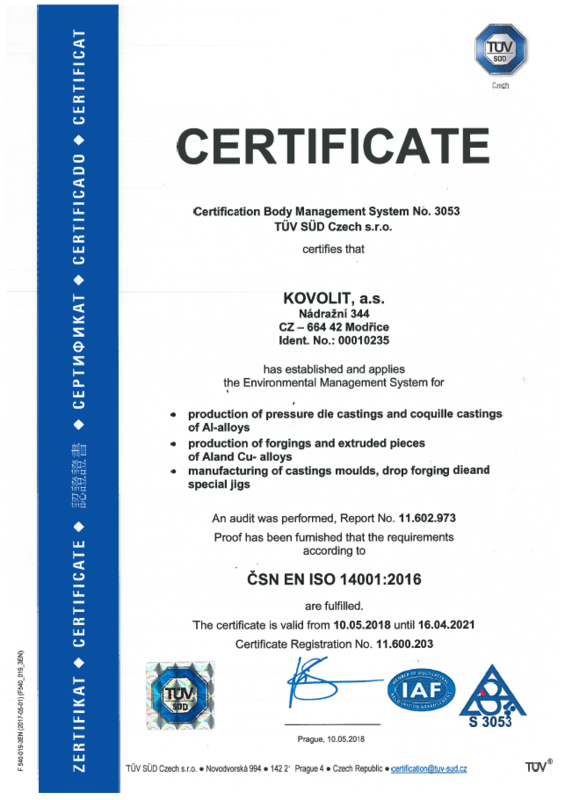 In 2016 it became the sole owner of Kovolit, a. s. Remet is the largest manufacturer of Al alloys in the Czech Republic and one of the leading processors of secondary raw materials. 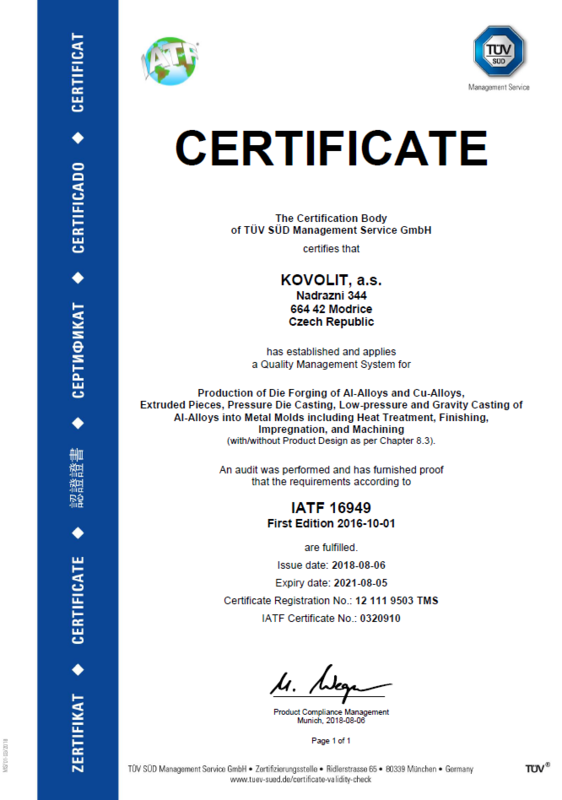 If you are interested in the history of our company, you can read our publication mapping the history of Kovolit from its foundation to the 95th anniversary of its existence in 2016. In early 2017, the company employed 540 workers altogether. The company's wide range of machinery and continuous investments into modern technology ensure manufacturing precision and the ability to meet demanding requirements of our customers. That is why there is demand for our products from companies from all over the world. Our most important foreign customers are for example Cooper Standard, Koki Technik, Truma. Our castings and forgings can be found in Mercedes cars, Audi cars and many others! The quality of our products and manufacturing processes is assured by certificates held by the company. 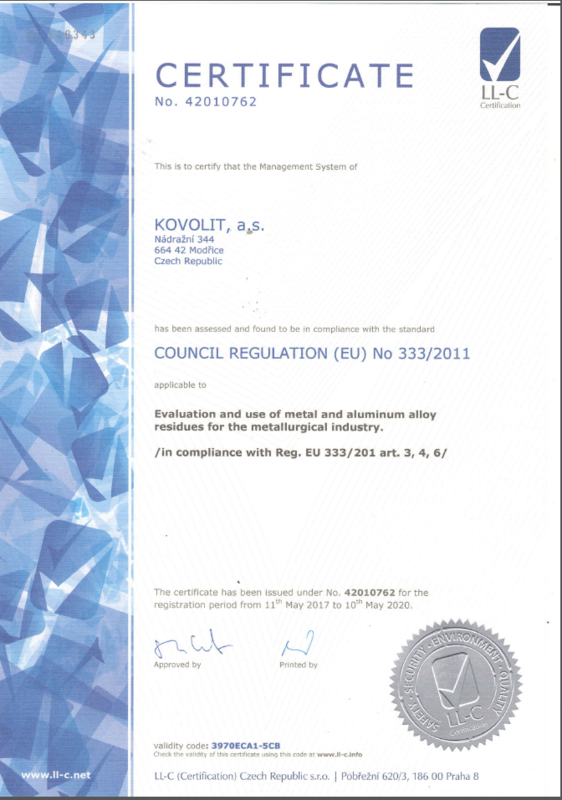 The company holds the following certificates: ISO 9001:2015, ČSN EN ISO 14001:2016, IATF 16949:2016, Council Regulation (EU) No 333/2011 applicable to Evaluation and use of metal and aluminium alloy residues for the metallurgical industry. New certifications will be placed on website after their receiving.